"Honoring the Past ★ Preparing for the Future"
Today, the West Point Association of Graduates holds true to the original ideals of this group, providing opportunities for Grads to gather in societies, on Founder’s Day, during reunions, at tailgates and at a host of other activities held around the world. We continue to strengthen the bonds of the “Long Gray Line” through communications and services. We also prepare for the future by building relationships which support current cadets…our future. Can you say "Sesquicentennial?" 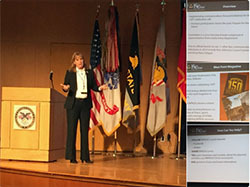 LTC(R) Deirdre Dixon PhD, Chair of Alumni Support, sets the stage for the planned 2019 celebrations of WPAOG's 150th anniversary next year #WPAOG150 West Point AOG (@WPAOG).